Epson Stylus SX440W printer is an inkjet multifunction printer that can copy and scan also. It is capable of producing both coloured and black and white outputs. It allows printing from memory card too. As the Epson Stylus SX440W has a weight of 4.2 kg, it is easy to carry. It has a height of 5.7 inches, a width of 15.4 inches and a depth of 11.8 inches. It can print 33 pages in a minute in case of monochrome printing and 15 pages in a minute in case of colour printing. It has a maximum printing resolution of 5760 x 1440 dpi. It has a media capacity of 100 sheets only. The scanning optical resolution is 1200 x 2400 dpi. 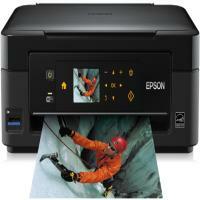 The Epson Stylus SX440W printer offers a memory card reader, USB port, and Wi-Fi. It uses individual Epson Stylus SX440W Ink Cartridges which are quite low cost too. It has a very less power consumption while operating and produces 37 dbA of sound while operating. The Epson Stylus SX440W is an inkjet multifunction printer that can produce coloured outputs also. It has an extremely good output quality and can print directly from memory cards, smartphones and tablets. The Epson Stylus SX440W Ink Cartridges are quite low cost. It does not possess an automatic document feeder or duplexer and has a limited paper handling capacity. Also it lacks a PictBridge port. Overall, it is a great printer to use. Q. Are all pages printed by compatible Epson Stylus SX440W ink cartridges from multipacks of good quality? A. Yes, you can be sure of consistency and quality in every page printed by these ink cartridges; compatibles are as good as original cartridges in every way. Q. How do I specify the colours of cartridges I need in a multipack of Epson Stylus SX440W ink cartridges? A. We have created a dedicated space on the page of this ink cartridge where you need to type your preferred colours and enter the quantity you want so that we can process the order accordingly. A. Please rest assured that compatible ink cartridges are as safe and reliable as their original counterparts. They are not known to have caused any damage to printers. They are just the same in virtually every aspect as original ones. Also, they are manufactured using the best technology and put through rigorous quality assurance tests. The fact that more and more people are switching over to compatibles is proof enough of their authenticity and performance. Q. Are Epson Stylus SX440W ink cartridges easy to install? A. Yes, the installation process of these Epson ink is simple and easy. Q. I have a multipack of Epson Stylus SX440W ink cartridges (20 ink cartridges) which I’d like to use with Epson Stylus SX445W printer also besides Epson Stylus SX440W as I’m aware both are compatible, but I’ll be surer if you recommend it as well…thanks. A. Absolutely. These ink cartridges are perfectly compatible with Epson Stylus SX445W printer also and will give the same results and output, so please go ahead without any worries. Q. How do I print photos from my Epson SX440W printer without using a PC? A. Load photo paper into the printer. Insert the memory card from which you want to print your photo. Select “Print Photos" on your printer LCD. Select the photo you want to print and specify number of copies. Select appropriate print settings and start printing. Q. What is the difference between the T1285 ink cartridge pack and the T1295 ink cartridge pack? A. The T1285 ink cartridge pack contains T1281, T1282, T1283, T1284 ink cartridges and the T1295 ink cartridge pack contains T1291, T1292, T1293, T1294 ink cartridges. Both are Epson Stylus SX440W ink cartridges, the only difference is that cartridges in the T1295 pack have a higher ink volume than those in T1285 pack, meaning they can yield more pages per cartridge. Q. What are the dimensions of the printer and how much does it weigh? A. Epson SX440W measures 5.7" in height, 15.4" in width and 11.8" in depth. It only weighs 4.2 kg making it compact and easy to move around. Q. How do I setup my SX440W to the Wi-Fi? Q. Will compatible Epson Stylus SX440W ink cartridges work as well with my printer as the original ink cartridges? A. Yes, our compatible Epson Stylus SX440W ink cartridges work fine with the printer. They will offer the same output as the original cartridges. Q. I need a compact printer with low energy consumption for my home. Is the Epson Stylus SX440W suitable for my needs? A. Yes, this printer is perfect for you as it is small in size and consumes only up to 15 Watt while using. Q. Will this printer work well with my Windows 7 PC? A. Yes, Epson Stylus SX440W printers work well with all versions of Windows and Mac. Q. How long will it take for Epson Stylus SX440 ink cartridges to be delivered to me? A. Your product will be delivered to you on a 1 - 2 day basis, if you order before 12 noon. If your order is urgent, you can reach out to us on 048 30833221.